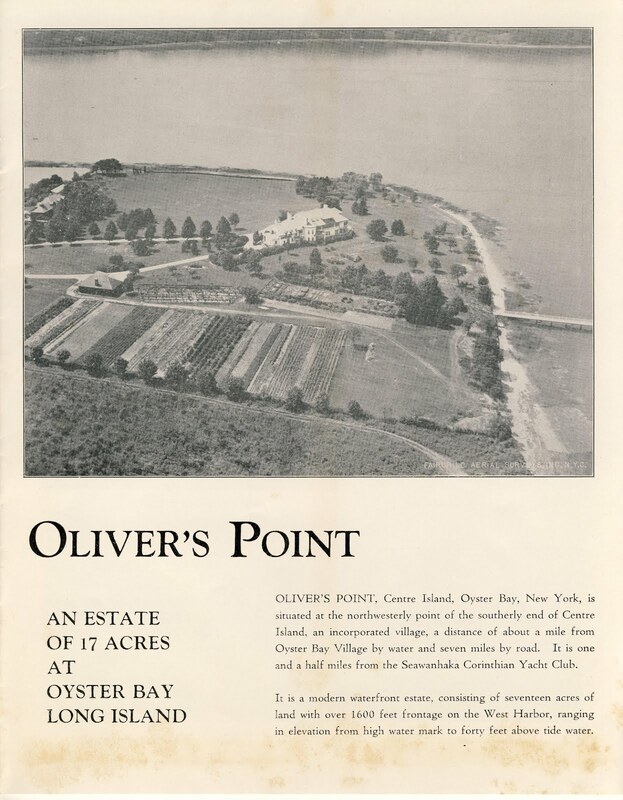 A brochure advertising 'Oliver's Point' the Herbert Ludlam Smith estate designed by Herbert R. Brewster c. 1912 on Centre Island. 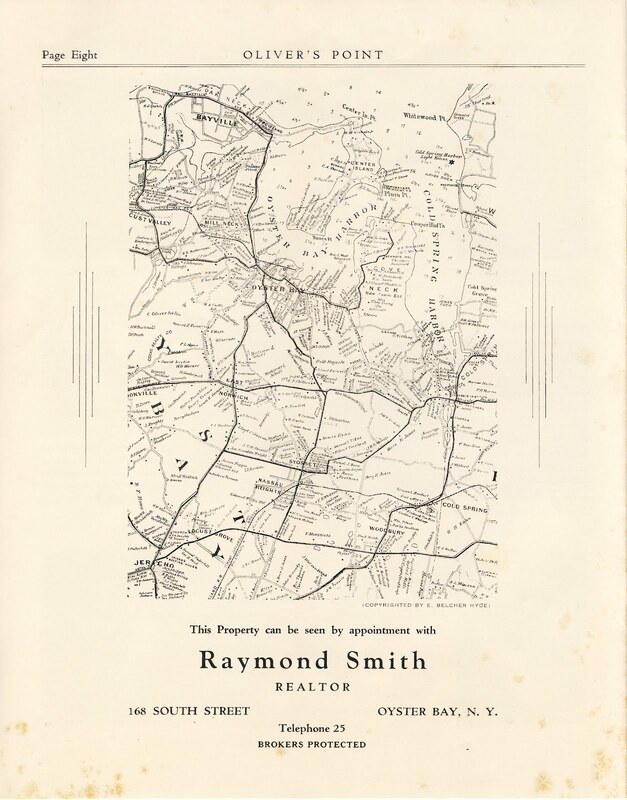 Smith was a partner in the brokerage firm of Smith & Lewis. 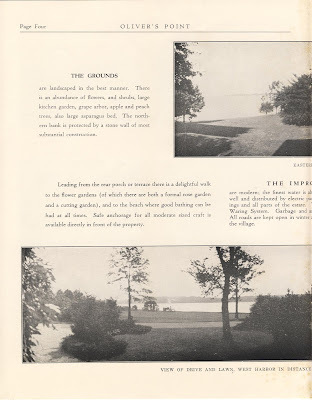 The estate was later owned by George Fisher Baker III who renamed it 'Ventura Point' and hired Walker & Gillette to design alterations in the 1930s (as it is pictured here). Baker was the grandson of George Fisher Baker and chairman of the board of First National Bank of New York. The house has since been demolished. 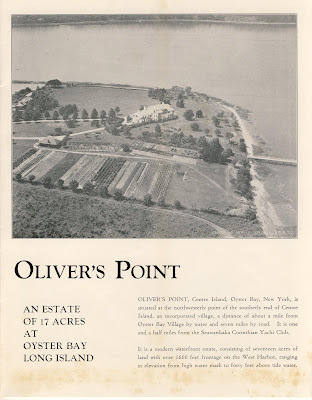 Click HERE to see where 'Oliver's Point' stood on google earth. Interesting tidbit; the house currently on the property was designed by architect Oliver Cope, who also designed a 110 acre estate in Old Westbury, incorporating part of the old Whitney estate, completed in 2011. 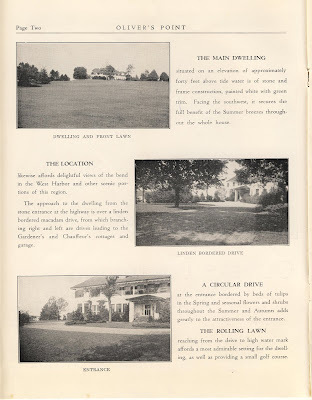 The Steven Schofeld spread, possibly called Scion Hall after an older farmhouse on the property to the northeast, is possibly the largest estate on Long Island in recent memory constructed along the lines of a genuine Gold Coast manse. 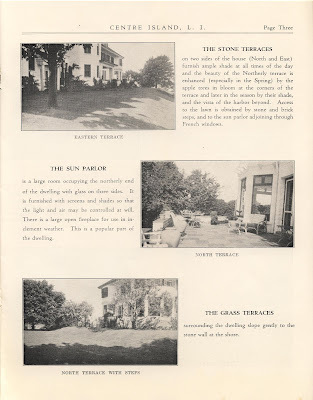 Interiors can be seen here; I had the good fortune to convince Steven's girlfriend to allow me access to the estate to photograph it shortly before they moved in; with all the ugly McMansions rising up like miasma from a swamp, I must say that Mr. Cope is the only architect I've encountered who puts a decent 21st century spin on 19th century opulence, with an impeccable eye for detail and proportion. I'm having trouble figuring out which version of the house came first, the one posted here or the smaller house in the grainy pictures on Wikimapia. 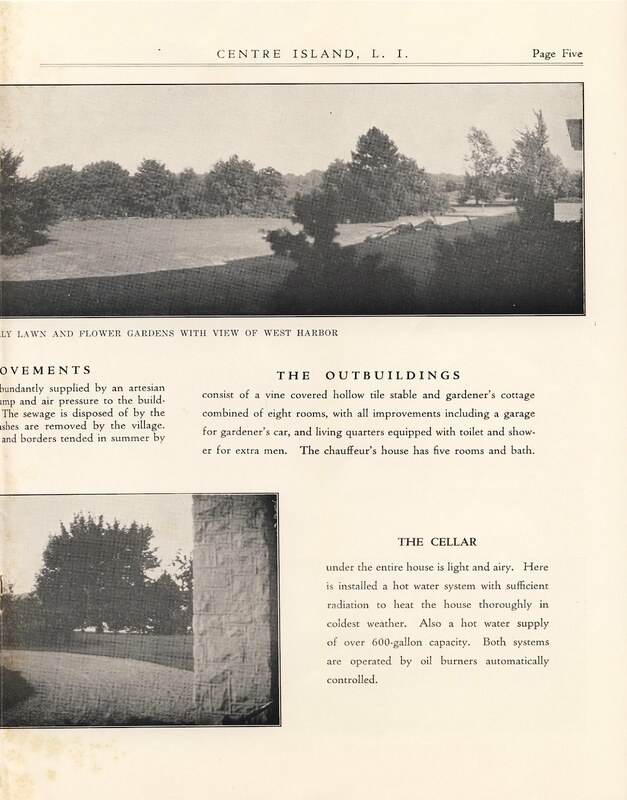 Wikimapia suggests the smaller house was the later version edited down from the house posted here. I like that smaller house best. This house feels like a lot of parts put together with no particular strategy for composition. Dare I say I think I even prefer the 1990's Normandy house over this one. Regardless of the house, the views must have been / must be spectacular. Being naive here I supposed, but what I don't get about Scion Hall is that if someone has that much money why they would build it but then make it available for print and film shoots? I can assure folks that I'm one of those people who just prefers privacy. Entertaining is wonderful, a house tour for a cause is fine, but to market a home for movies takes something else. The owner probably doesn't do it for the money, but for the ego stroke and bragging rights. I have written many profiles of very wealthy people for magazines and many want to show me all their toys, the Ferrari collection, the artwork,the custom golf cart, the vintage cars, all the airplanes and I used to wonder why it was so important to show me, "just" a writer. But I came to understand that what good is it to have 18 Ferraris if no one ever sees them and oohs and ahhs over them. Renting out your home is to have thousands, maybe millions of people, see your home. As far as I know, Mr. Schofeld certainly doesn't need the money; I would venture to say it's a matter of pride. My understanding from the conversation I had with his (somewhat younger) girlfriend is that he took over a decade to accumulate, parcel by parcel, the acreage for his spread, a third of which remains undeveloped. The main drive passes through the gate on Whitney, past a huge service building, through his 9-hole golf course, over a bridge over a pond to circle around to the main entrance, past which is the large guest house sited on the footprint of the old Tower home. Whatever his motivation (ego, avarice, etc.) I must confess that it warms the cockles of my heart to see someone spend so much money trying to faithfully reproduce a bygone era. I thought that's the main house you see from the road...on Post/Whitney, right across Clock Tower Road. Was the original home demolished before the current owner built this house? security word def - "zednext" - a term describing the amount of talent and taste that modern LI developers have. TPR...what is the address to that site? 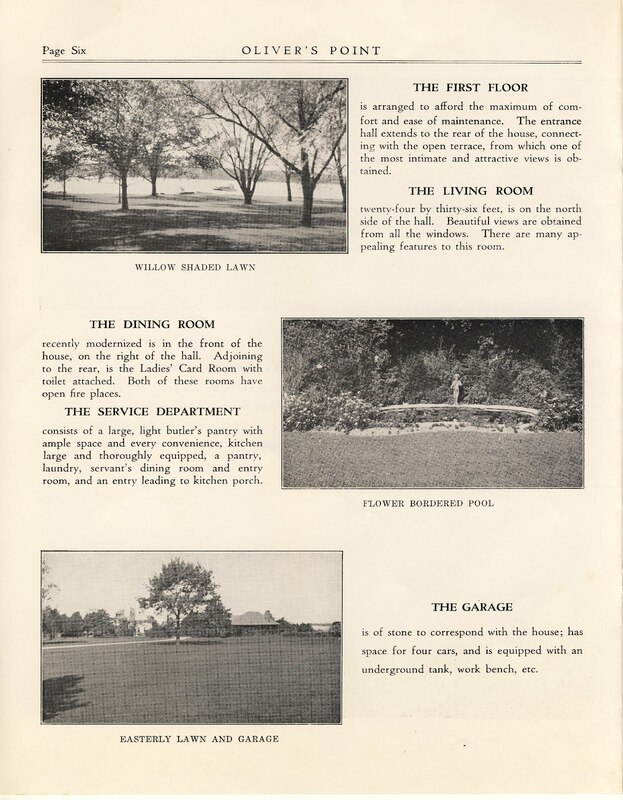 The original Scion Hall (a rather modest farmhouse) still stands, but the Roderick Tower (husband of Flora Payne Whitney) residence was demolished to make way for the guest house, which stands almost directly over the foundation of the Tower residence. 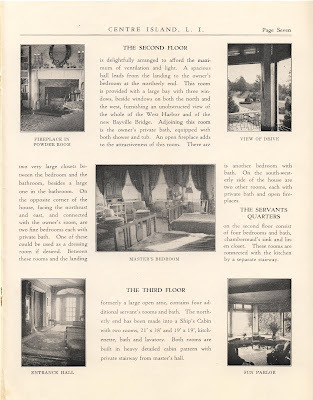 But the Roderick Tower house was Delano & Aldrich, whined the Dilettante plaintively. 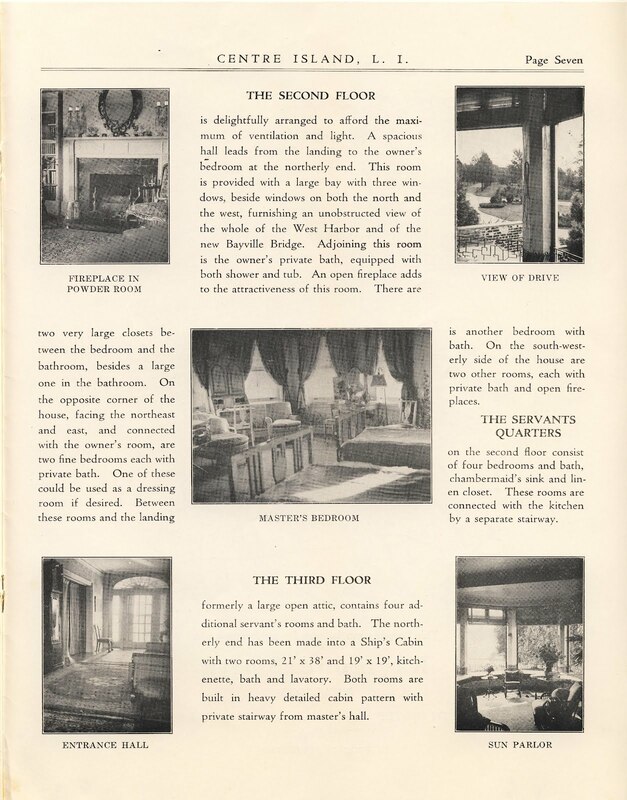 Any photos of the Roderick Tower home? The Oliver Cope House for the site pictured is well done. The house to the south (right on the point) built for house owner #1's brother, unfortunately, completely misses the mark, is too large for the site, much too visible and an eyesore from the water. Schoenfeld's house is well done, save for the absurdly unattractive perimeter wall. As one would might expect from a loyal reader of this website....why,oh why couldn't he have saves some threatened, superior property, such as Knole? At the end of the day, though, not a bad outcome. I knew the property in Old Westbury before it was torn down....in the woods was a rather bittersweet looking fountain with statuary, including a headless dog. I wonder if it's still there. The woods seems undisturbed. 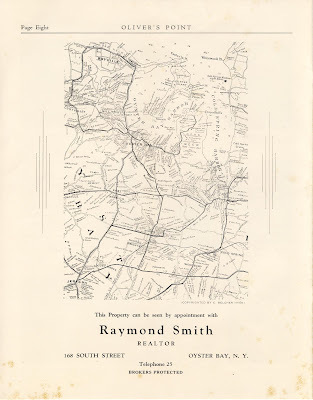 I also recall a lone chimney in an open area....perhaps from the farmhouse?